In discussing the history of adoration, Father Moerman referenced the Feast of Corpus Christi, Latin for the Most Holy Body and Blood of Christ, and how it became a solemnity in the liturgical year. In 1263, a priest was en route to Rome and he doubted his vocation. As he lifted the host, it broke and bled on the corporal, a white cloth. A year later, Corpus Christi was declared a feast and it continues to be celebrated on the Sunday after the Most Holy Trinity. To this day, the blood-stained corporal remains in the Basilica of Orvieto, Italy. Adoration is a significant part of World Youth Day, a week-long catechesis for people of all ages where on Saturday night, all the youths gather for adoration. Pope John Paul II started World Youth Day in 1993 and it has been held in various cities such as Denver, Toronto and Sydney, Australia among others. The first World Youth Day for Pope Francis in 2013 took place in Rio de Janeiro with an estimated crowd of 4.5 million. Copacabana Beach was flooded with people during Saturday adoration. “That was one of the most profound witnesses of people adoring God,” Aquilante said. According to Pope Benedict XVI, adoration is the natural consequence of the celebration of the Eucharist. Through the sacrament, Jesus forgives us and loves us out of our sinfulness. While it is a challenge for us to pass this gift to others, actions speak louder than words. Father Moerman concluded the evening by reminding everyone that faith is the real presence of God and that we need God’s grace. Although adoration is often thought of as private prayer, it can become a way of communal prayer. Many people who came to hear the talk on adoration had attended prior CYACC meetings and activities. But it was the first time for Eric Ruth of Phoenixville, a parishioner of St. Basil Parish in Kimberton. Zane Christmyer of St. Norbert Parish in Paoli is also new to the group and enjoyed the talk. The CYACC meets every Wednesday evening at rotating parishes in Chester County, at which about 50 to 60 people at least two events per month, according to group leaders. The first Wednesday of the month is Adoration Night with the Blessed Sacrament exposed. On Aug. 9 at 7:30 p.m. the group will meet at SS. Peter and Paul for a spiritual direction session with Heather Makowicz and Norbertine Deacon James E. Garvey, both certified spiritual directors from Daylesford Abbey. The group will host a Social Night on Aug. 16 at East Goshen Park with games and fellowship. Adoration – offers strength and courage to move on in life. 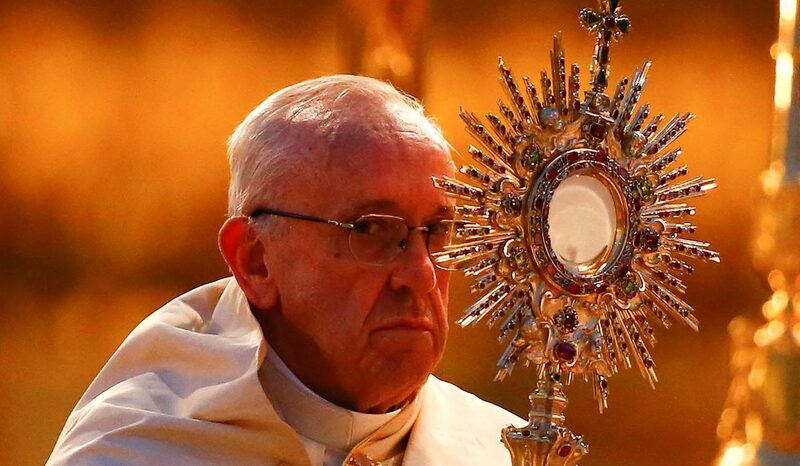 How did people manage to be close to Christ for the first 1500 years of Christianity when there was no Eucharistic adoration? We find the answer in Scripture.